"My favorite ring is my custom 25th anniversary ring that Steve created about 15 years ago with a beautiful 1.5ct F VS2 diamond and accent diamonds that graduated in color from light to dark yellow set in shiny high gloss platinum. This ring never fails to enchant me. It came about when my husband and I were in a boat fishing, and talking about our hopes, dreams and plans, when he surprised me with the suggestion that it was time for a nice diamond anniversary ring. 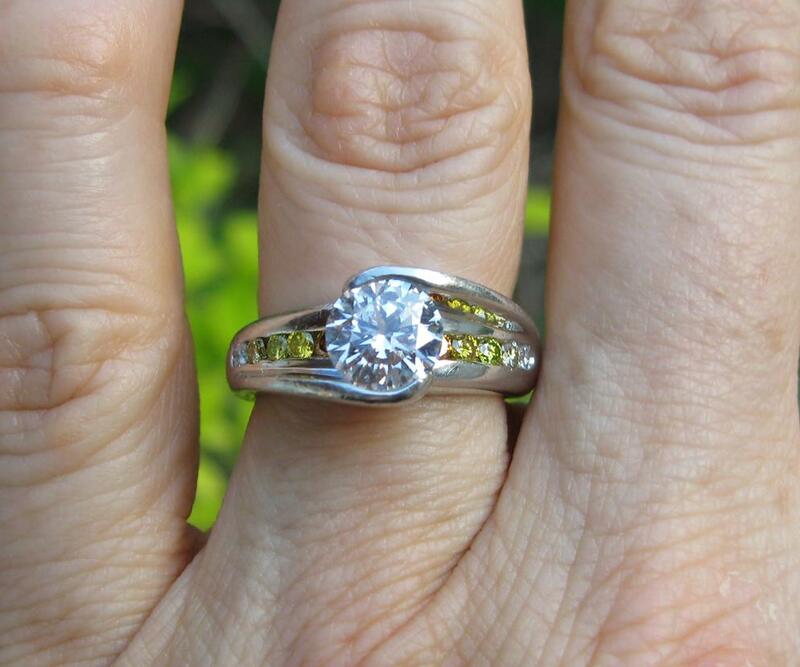 This ring was designed to go solo as a replacement on my left hand for both my engagement ring and my wedding ring. We even put the original wedding ring inscription inside. This ring was a major investment for us and we wanted it right, so we went custom with Studio Vincent. Steve called in a diamond broker and personally selected my diamond. I know, because I happened to drop by the shop as he was going through the boxes of diamonds. The shop assistant had to shoo me away. About two hours later I got the call, “We found your diamond!” The accent stones are beautifully matched, and I’m told, would be extremely difficult to ever replace. The ring is heavy, since Steve made it “heirloom” quality. It will take several lifetimes to wear out that shank. I share a love of moonstones, sparkly colored diamonds, and red gold with Steve. I love his style and his creations. My husband and I are glad to own many, many pieces of custom jewelry created over the years, and I am delighted to be considered one of his special customers. Over the years one of my guilty pleasures has been to stop by his jewelry shop over lunch to view the eye candy. Steve, may you continue to design and perfect your craft for many, many years to come."